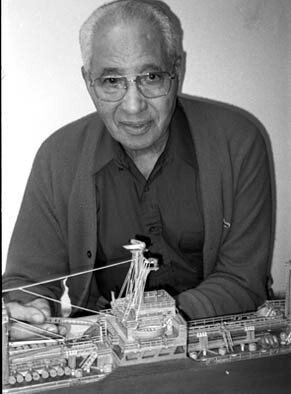 Aniceto "Chéché" Gilmette of New Bedford makes ship models from memory, based on his Merchant Marine days. Gilmette was born on the island of Brava, Cape Verde and is a descendant of a long line of whalemen. At age 19, he traveled to New York by steamer and immediately joined the Merchant Marine. Initially, he worked as a cook, but eventually became chief steward, working on various vessels, including two oil takers, the Exxon Lexington and Exxon New York. While growing up on the island of Brava, Aniceto was acquainted with an elderly gentleman who made boat models. He watched with great interest. He and his friends made small sailboats from balsa wood, which is indigenous to the island. Using corn husks to make sails, the boys raced their boats in puddles. During WWII, while onboard a T-2 oil tanker, Aniceto was looking for a way to pass the time. Recalling his childhood hobby, he began to make his first large ship model. Without a tool kit, he created an intricate model using a paring knife (his "potato peeling knife") to carve the wood, improvising with turkey bones for stair railings. All of Aniceto's models are created completely by hand, without the use of patterns or kits, or even a formal scale. Built from memory, Aniceto's ship models are part occupational tradition ((the ships tell the story of his work in the Merchant Marine) and part ethnic tradition (packet ships and whaling barks were both important to the Cape Verdean experience.). Volante, the Cape Verdean packet ship Aniceto built in 2000, is similar to those used by many New Bedford relatives to transport cargo to and from the old country. His square rigger whaling ships remind us that many Cape Verdeans came to this country aboard whale ships.